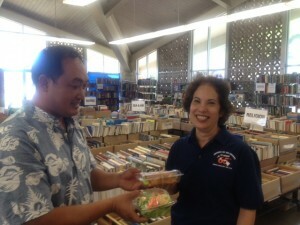 Today kicks off the 65th Annual Friends of the Library of Hawaii Booksale at Mckinley High School Cafeteria, with Members only Preview Sale beginning at 5:00 pm this afternoon, and continues for the next 9 days. Not a member? No problem, you can join on the spot for Preview Night Admission. Stop by for Leonard’s Malasadas on the weekdays, and on the weekends for some yummy eats, Ailana Shave Ice will be there, and some of Honolulu’s popular Street Fare as well. Click here for the line up. AlohaScan/Advanced Micro-Image supports The Friends of the Library of Hawaii again this year, by providing box lunches for all the volunteers that showed up yesterday to help set up for the event. 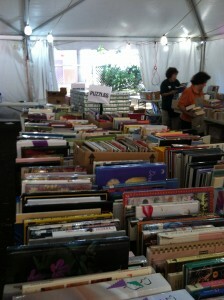 It’s our small way of saying thanks for your hard work to the countless volunteers who make this Booksale possible. Over 150,000 books are out for sale in the Gym, and Annex Tents outside at any given time during the sale, and new boxes of books are opened and put out for sale many times a day. If you have a few hours to spare, please stop by, browse, buy some books for your kids, grand kids, yourself even! Support our Public Libraries! See You There!